In collaboration with the Science Museum of Minnesota we've brought the award-winning RACE: Are We So Different? to the Hjemkomst Center. 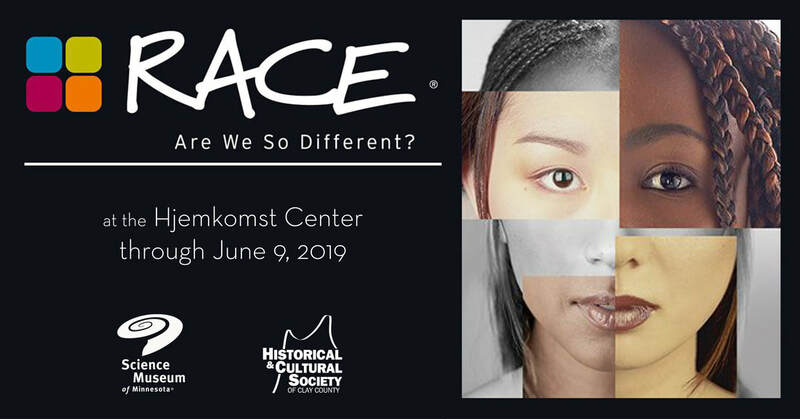 The Science Museum of Minnesota created a small-scale version of the powerful exhibition, RACE: Are We So Different?, for several communities in greater Minnesota, including Rochester, Worthington, and Moorhead. The original exhibition has been seen by more than 4 million people in 51 museums across the country since its debut in 2007. Created in partnership with the American Anthropological Society, the RACE exhibit uses photography, multimedia components, interactive activities, and more to help visitors look at race from three different perspectives – biology, history, and contemporary lived experience. The three perspectives are woven together to tell a compelling story of science with deep and lasting social impact. The impact of RACE: Are We So Different? is amplified when combined with thoughtful community programming – lectures, discussions, theater programs, art exhibits – that is designed to meet the needs of the people it serves. The Science Museum is working with partners in the community to develop complementary events and programs that are tailored to Moorhead’s needs. “We are honored to partner with the Science Museum of Minnesota to share these stories and this important science with our community. As historians we routinely find ourselves confronting pervasive myths in media, schools, and museums. RACE is very much a part of that effort, and it does a wonderful job confronting a difficult history with knowledge and understanding,” noted HCSCC executive director Maureen Kelly Jonason. Visitors can explore RACE: Are We So Different? at the Hjemkomst Center free of charge. It is located in the 3rd Floor Atrium. Supplementary programming will be offered through the Science Museum of Minnesota and the Historical and Cultural Society of Clay County.